Eastern Most Point in the State of Georgia - Beach Front! Great Mid-Island, Beach-front Location! 3 bedroom single family house with expansive views of the Atlantic Ocean! Step out front and step foot on the beach! You will enjoy stunning ocean views from the master suite featuring a king bed, walk-in closet, flat screen TV and private bath. A second room featuring a queen sized bed overlooks the ocean as well with each bedroom having access to a covered wrap-around deck. Custom built in 2004, this house has heart pine floors throughout and 10ft. ceilings. Wireless internet is also included!! This home sleeps 8 and is steps from restaurants, shops and other attractions. Reserve today and see why this house is the only one of its kind on Tybee. Please note that there is a 7 night minimum stay in June & July. Master has walk-in-closet, Kitchen has coffee maker, blender, and toaster. Hands down one of the best rentals we have stayed in! Rising and waking to the sound of waves crashing on the shore was worth every penny of this property. Clean, comfortable decor, well-stocked kitchen and good location. Located on the North side of Tybee, it is the quieter and less “touristy” side but still close walking distance to bike and golf cart rentals. Caroline was also very prompt in response when we requested an extra night on Tybee. (Which goes to show how great it is!) We highly recommend this rental for your family if you appreciate quiet and low-stress vacation life! Just as advertised. A beautiful spot on a fantastic clean beach. We rented bikes and could ride everywhere safely. Just bring shampoo and conditioner. Great house, perfect for hanging out with family or friends... beautiful unobstructed sunrise and beach views... love the porch, easy access to anything Tybee or Savannah. We can’t say enough about this property and the owner. This is our second time enjoying this piece of paradise for an extended stay and have already booked for next year! The location is perfect. We could walk to either end of the island depending on what we wanted to do each day. We enjoyed many meals “at home” which was easy with the kitchen having everything you could possibly need to do so. Our favorite restaurants were North Beach Grille (when we wanted to sit outside and enjoy a burger and sweet potato fries) and we loved the food at the Sundae Cafe and the new restaurant, Salt Island Fish & Beer. The view from the house is amazing. We enjoyed the beautiful sunrises each morning and had our own little happy hour each evening on the porch as the sun went down. The new porch furniture is wonderful and the perfect height so you can easily take in all that view! Our first stay here was four years ago. The owners take a lot of pride in keeping the house clean and well maintained. It just keeps getting better! Our sincere thanks to Carolyn and her family. We’ve now found our “home away from home!” Already looking forward to next year! 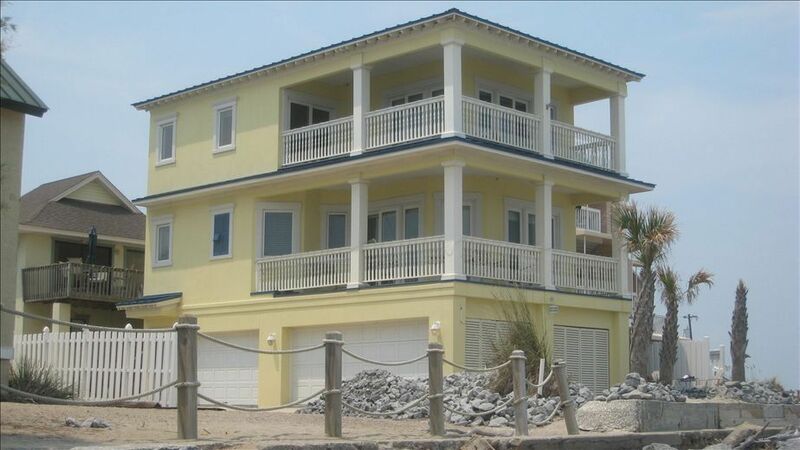 Best House Located on the Beach!!!!! This is by far the best house on the Beach!!!! The water is literally right outside your door!!! Easy access on and off the beach. I had a 73 year old couple traveling with us, and they could access the beach with no problem. Caroline is great to deal with!!!! This was our first trip to Tybee and staying at this house. We will definitely be back, but, only if we can stay here again. Thank you Kyle! It was a pleasure having you. Please come again! Property and home was exactly as described and pictured. There were no surprises and the home had everything our family needed. The property was exactly as expected, we enjoyed every moment. A bonus was it being walking distance to Salty’s Island Bar & Grille, our new favorite Tybee go-to for the best food and drinks. The view was amazing, making it enjoyable to even wash the dishes! Thank you for lending out your home, will stay here again!